HP on Tuesday unveiled three new Android tablets as a part of its Pro Slate-series for the business customers. The new HP Pro Slate 8, Pro Slate 12 and Pro Slate 10 EE are now available in the United States as a managed service or subscription for the corporates. “Mobile devices are changing how we live and work, and they also pose significant challenges to IT departments who have to support their now mobile workforces while keeping corporate data managed and secure. HP is the world’s largest commercial computing provider to the world’s largest companies. No other company is better suited to address commercial mobility than HP. Our devices feature built-in security, manageability and durability. When paired with our ISVs’ robust solutions, HP has created an ecosystem that helps companies to powerfully and securely harness the promise of mobility,” said Ron Coughlin, senior vice president and general manager, Personal Systems, HP, on the launch of the new tablet line-up. Coming to the tablet specifics, the HP Pro Slate 8 and Slate 12 sport a design similar to HTC’s One M8 smartphone and feature Snapdragon 800, 2GB of RAM and full HD display. The Slate 12 includes a 12.3-inch 1600x1200p display, while Slate 8 packs a 7.9-inch 2048x1536p screen. 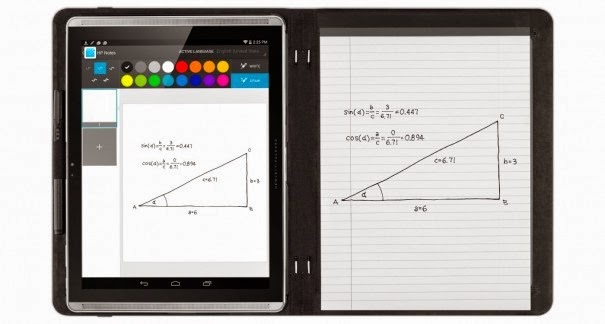 Both tablets run Android 4.4 KitKat and come with enterprise-grade security as well as support for HP’s new Duet Pen, which can be used both on tablet and normal paper. Lastly, the HP Pro Slate 10 EE sports a rugged design and is dust and moisture resistant. It is targeted to schools and packs 1.33 GHz Intel Atom processor, 1GB of RAM, 10.1-inch 1280x800p display and HP Duet Pen support.